Could these be the prettiest blushers in the world? Yes, I think they just could. Like the pretty top of a Gerbera flower just smiling up at you and promising to deliver perky Spring-fresh cheeks. 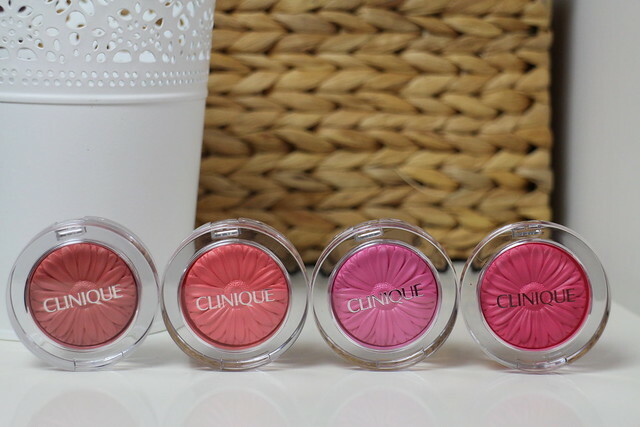 These are the new Clinique Cheek Pop Blusher shades for Spring and they really are just gorgeous in every way. 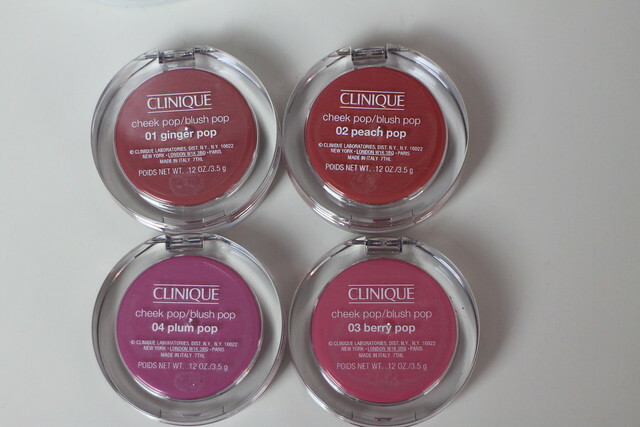 There are four shades: Ginger Pop, Peach Pop, Plum Pop and Berry Pop. So I’m pretty sure there’s a shade in the mix here for everyone – which is pretty cool considering there’s just the four shades. Just look at them, aren’t they gorgeous?! The packaging, is sleek and clear plastic – and feels nicely premium and solid. Then the gorgeous pan of colour, which does feel like a shame to destroy by using, but I can’t resist with such pretty colours. Going from left to right on the swatches above we have 01 Ginger Pop, 02 Peach Pop, 04 Plum Pop and 03 Berry Pop. My personal favourite has to be 02 Peach Pop – that gorgeous peachy shade with just a hint of golden shimmer always wins me over. But honestly, I really like all the shades. I know I’d need to use a light hand with Berry Pop as it’s the brightest of the bunch – but think this would look stunning on darker skin tones. Ginger Pop and Plum Pop would both look lovely on paler skin. I thin Peach Pop is probably the most universal of the four. Texture wise, these almost look like their going to be a little creamy, but they are powder – just really silky soft powder. Incredibly smooth and fine and not at all chalky in the slightest. All four shades have just the faintest amount of sheen to them, to give that ‘pop’ glow that the name promises. But not one to be afraid of if you don’t like a shine on your skin. Definitely on the health glow rather than disco ball side of things. 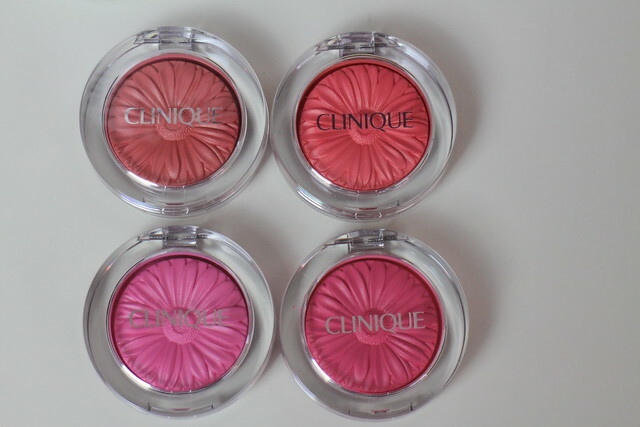 So excited about these Clinique Cheek Pop Blushers – expect to see these popping up in face of the day post all Spring/Summer long! Which shade has caught your eye the most? :O love love the Peach Pop colour! Cannot wait to try these out! I love Plumb Pop and Berry Pop, the colours just look beautiful. I love how they are shaped like little daisies, I have to get one of these now. These are so pretty! I love every shade (and that rarely happens)! Totally agree, usually one I’m not keen on too – but not with these! I really like the look of these, but not really sure that they’ll be any different to the other 15 – 20 blushes I own, so I don’t think I’ll be indulging. Love the look of these blushes! I love the packaging and the shade Peach Pop is beautiful! These look absolutely beautiful!! I have been hearing lots of good reviews about them and they all say what a natural lovely finishing they leave on the skin 🙂 A definitely must try for me! Uh oh…I had originally wanted only Ginger Pop, but these swatches make me want all of them!